The Americas Rallycross (ARX) 2019 schedule includes six ARX Supercar events and nine ARX2 events, beginning in June and concluding in October. The ARX calendar expands for the 2019 season, including two new events in the Midwest at Mid-Ohio Sports Car Course and Gateway Motorsports Park, marking the championship’s first visit to the Midwest. The season begins at the historic Mid-Ohio Sports Car course, June 8 - 9. The 10-turn, 0.7-mile circuit will be located in the legendary “keyhole” section of the circuit, providing fans with an iconic view of the entire course. The series will then travel southwest to Gateway Motorsports Park in July. Located just outside of St. Louis, Missouri in nearby Madison, Illinois, the facility will host the ARX of Gateway and will mark the venue’s first ever rallycross event and the first ARX Supercar doubleheader. “We are excited to host this incredible new series and showcase our specially-designed rallycross track at Gateway Motorsports Park. We strive to offer a wide variety of entertaining events and it's our belief that Americas Rallycross is another tremendous addition to our schedule. The motorsports fans of the St. Louis-Metro East region continue to support a wide array of events at our venue and we expect their enthusiasm to continue with this great addition," said Gateway Motorsports Park Executive Vice President and General Manager, Chris Blair. 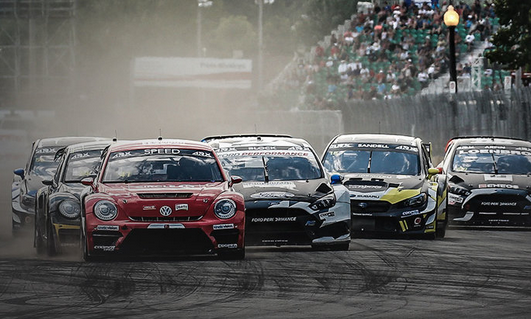 In August, the streets of Trois-Rivieres in Canada will once again host the ARX and ARX2 series alongside the FIA World Rallycross Championship Presented by Monster Energy Drink. ARX also returns to the Circuit of The Americas in Austin, Texas on September 28 before concluding the season with a second trip to the Mid-Ohio Sports Car Course for the Cooper Tires ARX of Mid-Ohio, October 5 - 6. Tickets for the June and October Cooper Tires ARX of Mid-Ohio events and ARX of Canada are on sale now, while tickets to the ARX of Gateway and ARX of COTA will be on sale soon. For the latest ARX news, visit ARXRallycross.com and follow the championship on Facebook, Instagram and Twitter, @ARXRallycross.